At Champlain College’s 2019 Elevator Pitch, students from all majors and years competed to pitch ideas to “executives” in a fictional elevator. The 12th annual Elevator Pitch finals took place on March 5, where 20 finalists competed in four categories—Entrepreneur, Game Developer (pitched to Associate Dean for Administration Dr. Roz Whitaker-Heck), Job/Internship Seeker, and Nonprofit/Social Advocate—for cash prizes. “I think that pitching is a useful skill no matter who you are or what you do. But especially for the game studio majors this is important,” explained Sam Scott ’19, “I believe the nature of creating games is pitching ideas all the time. 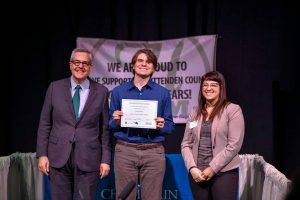 And I know that with this practice, I am not afraid to show anyone what I’m working on.” Scott, a Game Design major, took home first place in the Game Developer division and used the competition to prepare for his trip to the Game Developers Conference. In addition to two CCM students taking home prizes, CCM Associate Professor of Broadcast Media Production Keith Oppenheim served as the MC and CCM Assistant Dean Eric Ronis, who also runs the improv comedy troupe Los Dormant Volcanos, held several improv-style workshops to help participants prepare for the event.